Are you and your children on Summer Break yet? The Little Gal is. As you read in our post “A Hog Hunt to Heal Pops” we generally plan a Spring Break adventure for our Little Gal, but had to skip it this year. We were supposed to go to Oklahoma to visit friends and hunt feral hogs. We re-scheduled that trip and combined it with another, which would include none other than a trip to Alabama to hunt hogs as well. Our trip started with a couple days in the Denver, Colo., area with a visit to Grandma and Grandpa as well as Bass Pro-Shops. Since we come from a small town, the shop is like an amusement park to us. The Little Gal and I “got lost” in the store looking at the ducks and fish swimming in the pools. We gathered last minute gear and “practiced” shooting in their laser gallery. Then Hank and Grandma shooed us out of the store, and we sported giant smiles on our faces. From Denver, we headed south to Oklahoma. In addition to hunting, our friend had some fun and education planned. It seemed to be a coincidence, but on our way to Oklahoma the Little Gal had asked if we would be going to any museums or zoos. We ended up doing the next best thing. We saw a Bengal tiger! 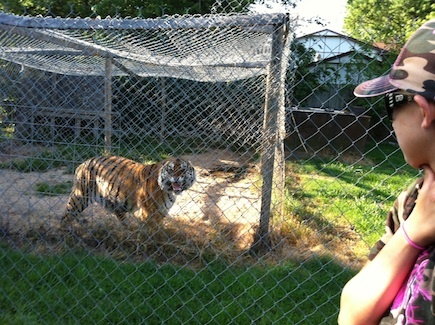 Our friend arranged for us to meet Brent Gorman, a famous taxidermist in Muskogee, Okla. To our surprise, he also has a license to keep a tiger. The Little Gal was amazed. We stood not 10 feet away from the gorgeous tiger. He looked a bit frisky and flicked the tip of his tail. He crouched, looking through the blades of grass, as well as cage. We were so happy to see a real live tiger and just as we were preparing to leave he jumped and roared. Maybe he wanted us to stay and play. We booked it out of there anyhow, then raved about the gorgeous tiger and the amazing taxidermy work we saw. We hunted two evenings, but didn’t see any Oklahoma pigs. We did catch an Eastern box turtle. We were keeping close watch as we stalked through the grass looking for pigs so we would not step on any snakes. All of a sudden we heard something scurry. It was a “cute” little turtle. We lost all thought of our business at hand, which was hunting a wild pig. We went scurrying after the turtle. 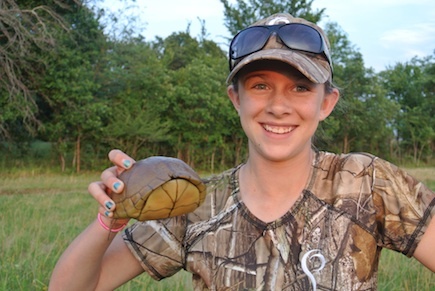 Hank came up with the turtle and the Little Gal came up with a smile. Later we learned that there are also snapping turtles in the area and that we really should stay clear of those. Whew! Good thing it was just a friendly little one! We were led through the brush and thick trees looking for the wild pigs and then came to what we thought was the most beautiful fishing hole. We followed an old train bridge and stood up above the water watching the fish jump, turtles swim and spiders crawl. Not long after, we heard a turkey gobble already in a tree a couple hundred yards away. The Little Gal and I grinned and asked if we could go look for it. We were told probably not because judging for the direction it would mean really getting into the thick brush increasing the chance of bumping into venomous snakes. It was near dark so we made our way back. The next day we piled into the car again and headed across Arkansas, the corner of Tennessee and Mississippi to Alabama. After a long, scenic drive we made it to Rack Nine Outdoors (RNO) and met none other than the WON’s very own Barbara Baird, who had arrived just before us. We were served an outstanding dinner and afforded the time to visit Barb, her husband Jason, son Alec and Her Camo Shop’s Jeff and Shelly Ray. 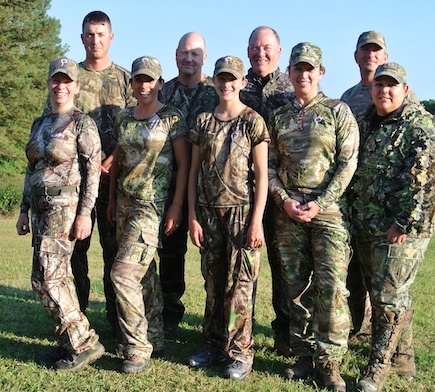 With our bellies full, the RNO crew took us out to our stands for an evening hunt. The Guru Huntress, Nancy Jo Adams, and Richard Holt also joined us later. The Little Gal of course has already harvested a pig so she is an “old pro.” She, however, had never hunted from a stand. She and Hank went to a box stand and I was taken for my first hunt from a tree-stand. What do you know?! Firsts for both of us. It was fun to do something new. I settled in my stand and heard some scuffling in the leaves. I was ready, but it was only a raccoon. Not 30 minutes later I heard a shot. Yep. None other than the Little Gal. She showed us all up by smacking a feral pig right off. I was so happy and wanted to cheer as I sat watching three raccoons. I watched them and more until a couple hours after dark. Then I couldn’t contain myself any longer. I had to go in to give my Little Gal a big high five. The remainder of our stay at RNO produced no more pigs, but the Little Gal and I did get to spend time in a stand together and we watched many beautiful birds, rabbits and raccoons. What a summer vacation/make up spring break! An “amusement park,” a “wildlife park,” a “museum” and the Little Gal finished it off with a bang. The Little Gal and I wish you a happy summer and hope you get to be outside as well. Keep up with Mia & the Little Gal at Mia’s blog, My Many Outdoor Adventures. This Retro WON first appeared December 20, 2012. Sounds like quality family time. We are heading out the beginning of July to North Carolina for a hog hunt. This will be the first hunting experience where I am the one with the gun. How exciting to be going on your first hunt! Best of luck to you. Shoot straight! Let us know how you do. Mia & the Little Gal are rooting for ya!!! There is nothing better in my opinion than bringing kids up in the outdoors. Both my boys were raised hunting, fishing and giving back to nature. I wish more parents would spend the time to teach their kiddos these values. I get so frustrated when kids are raised in front of the television or video games. Don’t get me wrong I love watching my shows on t.v. but thats a reward in my book. Thank God for parents like Mia and Hank. Keep up the great job. Thank you so much Thom. It is our goal to inspire more parents and mentors to get the kids involved in the outdoors. Thanks to the WON, I know I’ve touched at least a few. I appreciate your support. Mia, as always, you just keep knocking that ball out of the park!!!! Wow! I humbly thank you Michael!